Everyone knows about “The Emerald City,” but right across Lake Washington, just 20 minutes east of Seattle, awaits lush scenery, award-winning restaurants, outdoor adventures and luxe shopping. Not to mention a wine country that gives even Napa Valley a run for its money. 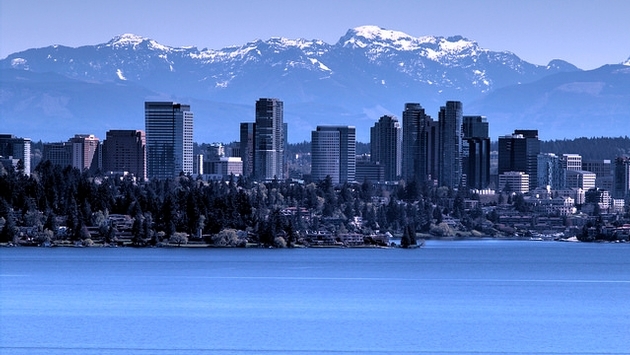 As I made my way via taxi to Bellevue, I was astounded by how unreal Mt. Rainer appeared in the distance. Once I arrived at The Hyatt Regency Bellevue, I was even more pleased that I could continue admiring this view from my window. For those looking to stay in the area, The Hyatt is an upscale hotel whose location is ideal for taking advantage of the hundreds of shops, eateries and bars the city has to offer. It’s also ten-minute walking distance from Bellevue Downtown Park, a beautifully designed 20-acre space that features a wraparound water structure culminating in a large, man-made waterfall and pond. Start your day off at Eques. While you have the option of trying a little of everything via buffet-style meal, Eques prides itself on highlighting seasonal ingredients. This is best experienced through its a la carte items. Stand outs include the sweet French toast topped with cream cheese icing and Woodinville whisky syrup, or the more Northwest inspired cedar-plank salmon benedict with fresh Pacific salmon. If you love Asian cuisine, head to Wild Ginger, which incorporates the flavors of the Pacific Rim into its innovative plates. Start off with the tender Balinese BBQ pork spare ribs and be sure to order the house specialty: fragrant duck served with steamed buns and a Sichuan peppercorn salt and sweet plum sauce. Wild Ginger also has an extensive cocktail menu with unique drinks like the Fire of the Phoenix, a spicy libation with Thai chili infused olmeca Altos tequila reposado. Another option? The Lakehouse, a chic Northwest farmhouse concept by James Beard Award-winning chef Jason Wilson. With an emphasis on sustainability, local ingredients and farmer-forager relationships, it offers a diverse menu that’s divided into categories such as forest and garden and sound, sea and rivers. This lively restaurant offers a nice selection of dishes ranging from a grilled octopus with chorizo to a flavorful grilled Niman ranch pork chop with white cheddar grits. For those with an appetite for quality steaks (and seafood), take a seat at John Howie Steak. This steakhouse is the real deal. It offers an unparalleled selection of meats, including 75-day custom aged American Wagyu beef, Australian Wagyu beef and Japanese “A5” 100 percent Fullblood Wagyu beef. John Howie also offers a full gamut of rib eyes, filets and porterhouse cuts. In addition to the carnivorous plates, it features premium seafood such as king crab, Atlantic lobster tails and, for lunch, an incredible Applewood grilled seafood salad with Alaskan king salmon, jumbo shrimp and fresh Dungeness crab. If you have room for dessert, stop by Vivo 53 for an insanely large, decadent sundae. Maybe bring a friend: I hardly made a dent in my candy esplosione, which came stacked with M&Ms, seasonal ice cream, chocolate, pretzels, rock candy, chocolate peanut butter brownie, Kit Kat, Twix, swirl lollipop, whipped cream and finally, chocolate drizzle. Another tasty spot? Frost, an inventive donut shop that serves flavors such as Moscow mule, peach cobbler and a pineapple coconut “island escape” fritter. And how about trying to cook your own three-course meal? At Whisk, you can sign up for a hands-on cooking class with former Chopped contestant and current restaurateur Aaron Tekulve. You’ll have all the equipment and instruction necessary to whip up a gourmet meal. Next door to Bellevue is the picturesque Woodinville wine country. Home to 118 wineries and tasting rooms as well as 14 micro breweries, distilleries and cideries, this area is filled with more wine and libations than you can imagine, so pace yourself. Located next door to one another in the Hollywood District of Woodinville is Dusted Valley and àMaurice, two phenomenal, intimate tasting rooms that shouldn’t be missed. àMaurice, owned and run by the Schafer Family, is based out of the Walla Walla region. Get a taste of the fruity, acidic Estate Syrah "Fred" and ask about the fun story behind it (hint: Fred is a hummingbird!). Fun fact: In addition to producing beloved wines, head winemaker Anna Schafer designs and paints her own estate wine labels. Dusted Valley also has its vineyards based in Walla Walla along with other sites in Washington State. As a vineyard whose production is only about 7000 total cases, you know each bottle is something special. Ask to taste the Rhone-Inspired Squirrel Tooth Alice. In addition to being a bold red wine with a lot of character, you’ll get a kick out of its interesting story. Looking for an indulgent meal to soak up all that wine? Search no further than the nearby Purple Café and Wine Bar. Start off with the rich baked brie and the gorgonzola stuffed dates. Next up, order the cranberry chicken, a house favorite that offers a scrumptious combination of juicy chicken, smoked bacon and crunchy, refreshing celery and apple chunks. The Purple chopped is another popular option. Purple Café has an enormous selection; its wine list features more than 80 glass and 600 bottle selections. Its knowledgeable staff can also help guide you in all the best wine pairings for your meal. Bellevue is an ideal location for outdoorsmen and women, thanks to its proximity to the sparkling blue waters of Lake Washington and Mercer Slough Nature Park, a 320-acre wetland providing countless walking trails, wildlife spotting and hiking opportunities. If you’re looking to get on the water, stop by Cascade Canoe and Kayak Center's rental location at Enatai Beach Park. Once on the water, you’ll have the chance to boat through the heart of the slough itself where you’re likely to spot herons, turtles, otters duck and more. This tranquil canal is lined with water lilies and wild irises, making your ride a serene one. Visitors in need of fresh air sans the excursion should stroll through the Bellevue Botanical Garden, a 36-acre area that showcases some of nature’s most vibrant flora and fauna. The park is open daily with free admission.